For emergency field service call (908)369-1590. We can provide onsite emergency assistance 24 hours a day, 7 days a week. 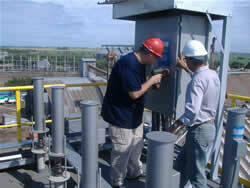 Many of Redkoh's seasoned Engineers have been servicing precipitators for over 20 years. The wealth of knowledge available within our staff is second to none. Our field service is always provided directly by Redkoh's in-house Engineers. We are ready and willing to solve your toughest problems. All items returned to Redkoh for repair must have a Returned Material Authorization(RMA) number assigned to it. To request an RMA number you can either call us direct at (908) 369-1590 or complete an online request here. Once submitted, you will receive a form with your RMA number and our shipping address. Please included this form with your return shipment. Our skilled Engineers are capable of repairing Redkoh products as well as equipment from other manufacturers. Same-day emergency repairs are available unpon request. If you ship your item to Redkoh with a morning delivery (Monday through Friday), you will receive the repaired item back the following morning (Tuesday through Saturday). It's a fact. Companies are trying to cut costs by cutting the labor force and allocating more responsibilities to fewer people. When this happens, you may find yourself, or your fellow workers, taking on jobs where proper training has not been provided.